Morning sunlight on freshly fallen snow is magical. The way the sun’s rays reflect off tiny ice crystals and slant through the pine trees reminded me recently why I love the mountains in winter. I was fortunate enough to spend a few weeks at our home-away-from-home in Winter Park, Colorado, in late December and early January. The temperatures were well below normal, and while the rest of my family was not motivated to spend much time outside, I braved the cold spell and explored some of my favorite trails. Despite the frigid temperatures that only once climbed above 20 – most days the mercury stayed in the single digits – I was able to get out and enjoy the beauty of not-often-traveled snow trails. One of those paths came on a day when the high reached 5 degrees in Fraser, just down Hwy 40 from Winter Park. At the end of CR 73 as you drive west out of Fraser, the road in during the winter season ends near the Experimental Forest Headquarters. From there, you can cross-country ski or snowshoe into the Byers Peak Wilderness. The area is pristine and the paths easy to follow. I found myself hiking into the deep woods on a beautiful morning of sunshine and clouds. The previous night, about 6 inches of snow had fallen on an already frozen forest. Lost in the Byers Peak Wilderness, my journey took me on pristine trails of fresh snow. The trees, covered in white, took on a fairy tale appearance. The trail was quiet and I’d found my solitude. Just a few miles from Fraser and Winter Park in Grand County, this is one of my favorite places to explore. While I had contemplated attempting to gain the summit of Byers Peak, I refrained. Instead, I’d wait until summer to hike to the top. It is a beautiful view from up near 13,000’. This mornings trek was enjoyment enough for one day. It is times like these when my body is sweating but my nose is chilling that I am thankful to be a part of this beautiful scene. I spent several hours here hiking around. Usually I have specific places or distances I want to reach, but on this morning I just wanted to walk and enjoy my surroundings. After a time, when nearly back at my car, I came across a male and female moose (a bull and cow) as they were crossing the path. The pair didn’t seem to mind me, and I certainly kept my distance while trying to capture their hugeness with a camera. 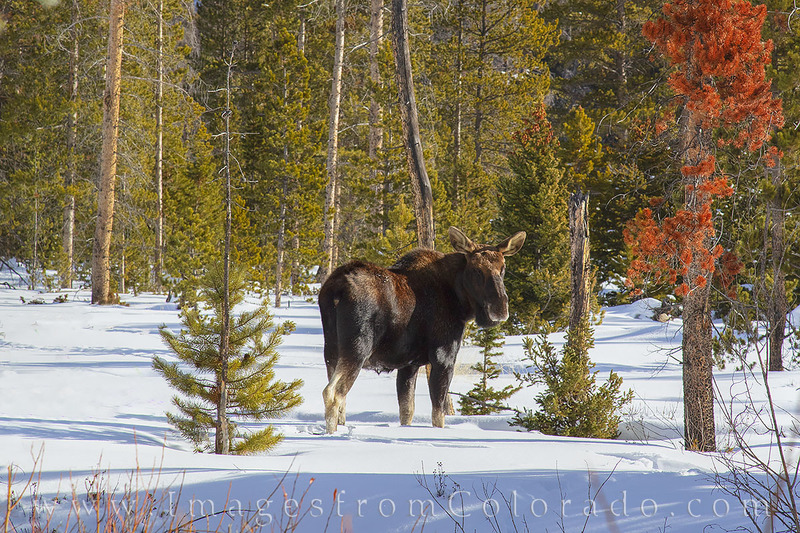 This female moose, called a cow, appeared along the St. Louis Trail near Fraser, Colorado. On a hike towards Byers Peak after fresh snow had fallen, I was fortunate enough to enjoy watching this beautiful creature, along with a bull moose a litte further out, adding a little excitement to a perfect morning in the mountains. The previous day, one of my best friends drove up from Denver so we could do some exploring. Not wanting to drive very far on snowy roads, we stuck close to Winter Park and hiked up the familiar Jim Creek Trail. Again, snow had fallen the night before, and this walk took us through a literal winter wonderland. The sun streaming through the frosty pine trees was amazingly gorgeous. 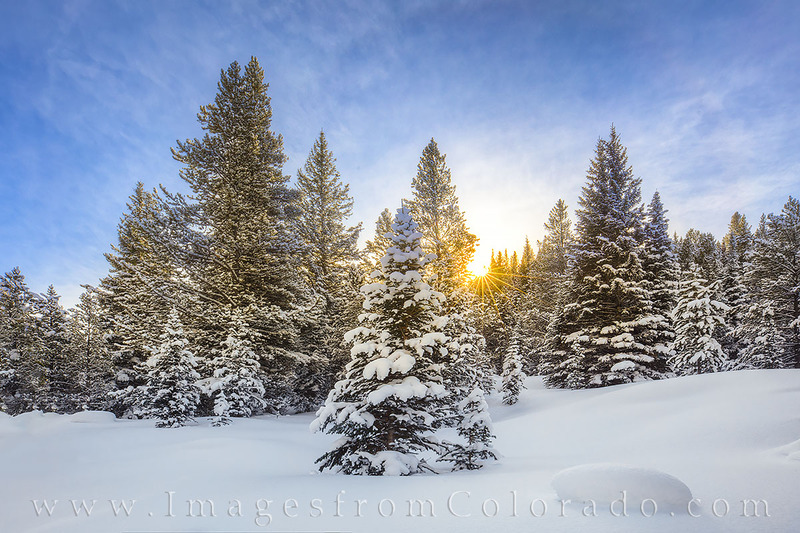 Taken one morning while exploring the Jim Creek Trail after an overnight snowfall, this photograph shows the sun sending a little warmth over the mountains and through the trees. This morning was quiet and peaceful and cold (12 degrees when this photograph was made), but if you keep moving you’ll barely notice the chill. We talked of football, past summer days, and those still to come. We talked of fond memories – climbing Uncompaghre (one of the thirty-one 14ers we’ve summited together), surviving an aggressive mountain goat on Mt. Harvard, and braving the sketchy drives we’ve made over passes between Lake City and Silverton. It is always good to reconnect with tried and true friends, and a bit sad to say goodbye until another opportunity arises. 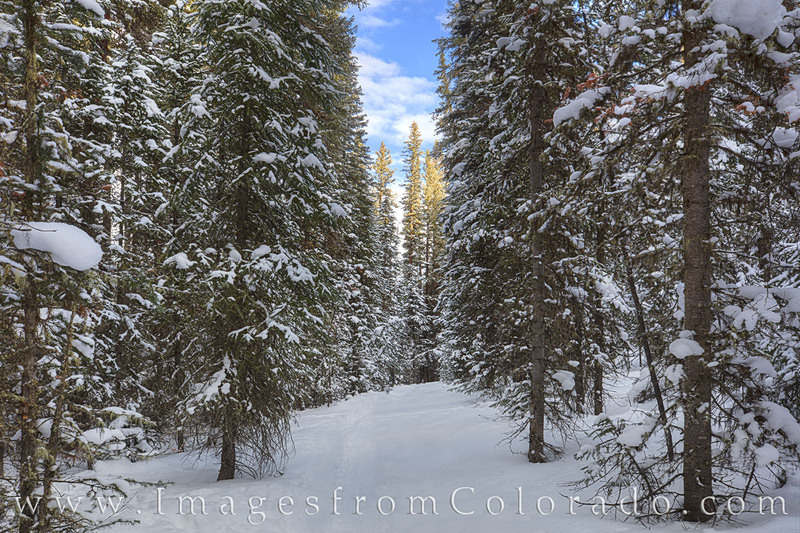 This panorama shows the valley and pine trees heading up to Berthoud Pass. Somewhere up there in the snow and clouds is Mount Eva (13,130’), Parry Peak (13,392’), and James Peak (13,301), and below is Jim Creek. Taken from just above the treetops, this view shows the beauty of Winter Park and Grand County after a fresh December snow. As for the family, my girls and I had fun building snowmen, playing in the snow, and sledding. And they bickered as sister do, too. My wife enjoyed her quiet time while we were out playing. We all reconnected with friends, both young and old, and were again reminded of the magic of winter. Posted in hiking, mountains, winter park, fraser, snow, winter and tagged winter park, snow, Byers peak, fraser, highway 40, berthoud pass, Rocky Mountains, hiking, exploring, morning, sunlight, drone, aerial.